Reading the Fantastic Four comics from the start. Issue #304 promises a bold new direction for our heroes, but is it? First things first: This issue was written by Steve Englehart, and he’ll be with the series for the next 30 issues, leaving quite a footprint on FF history. Englehart has a history of taking on an old franchise and breathing new life into it, years before guys like Grant Morrison, Alan Moore, and James Robinson made it cool to do that. For example, he’s one of several writers and artists to take credit for making Batman serious again after the campy ‘60s show went off the air, and he alleges that his writing on Batman inspired the 1989 Batman movie. Englehart says Fantastic Four was floundering and directionless when Marvel offered him the job. His solution was to take Reed and Sue out of the picture, claiming they were reasons the series had become boring and old-fashioned. We see him laying the groundwork for this in issue #304. However, like so many other writers and artists, Englehart famously feuded with Marvel editorial. (Has anyone not famously feuded with Marvel editorial? I’m starting to think I’ve famously feuded with Marvel editorial.) As we’ll see in the months to come, these feuds will lead to some odd twists and turns for the FF. Issue #304 begins simply enough, with Reed, Ben, Sue and Franklin in Reed’s lab as he tinkers with some sci-fi device. There are several pages of recaps, reminding readers of Franklin’s new powers, and Ben’s recent short-lived stint with the West Coast Avengers before he returned to the FF. Reed then makes a big announcement. He says he and Sue are leaving the team to focus more on Franklin, and Reed wants Ben to be the new team leader. Ben says no, thinking to himself that this is just an act of charity on Reed’s part. It’s also during this time that we see, somewhat terrifyingly, Reed still has Kristoff in a padded cell (! ), and Kistroff still believes he’s Dr. Doom. Johnny and Alicia (who is secretly Lyja the Skrull in disguise) are back from their honeymoon. They talk a leisurely stroll through the NYC sidewalks, talking more about Ben and how he’s having a tough time dealing with their marriage. Alicia is then swept away in what appears to be a gust of wind. Johnny pursues, flying at maximum speed, but can’t catch the “wind.” Johnny flies back to HQ, deducing that Quicksilver has abducted Alicia. Ben agrees, expositing that Quicksilver has turned evil and, with the help of the Zodiac gang, recently battled the combined forces of the East Coast and West Coast Avengers. Reed says he might have a way to track Quicksilver. 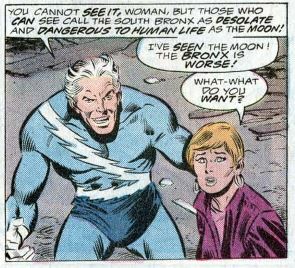 Quicksilver takes Alicia to a partially-collapsed building in the Bronx, which this comic depicts as some sort of post-apocalyptic wasteland. Specifically, Quicksilver describes the Bronx as, “Desolate and dangerous to human life,” and his evil plan is simply to leave Alicia there, where she will face death at the hands of “rats and roving street gangs.” He further explains that his wife Crystal (Johnny’s old girlfriend and a former FF alternate member) recently dumped him and had an affair with a real estate agent. Now, Quicksilver is enacting epic revenge by seeking to harm anyone who ever cared about Crystal. The Fantastic Four find Quicksilver at that moment, with Reed giving a long-winded explanation of how they found him. (Something about his lungs expelling natural poisons faster than anyone else thanks to his speed.) Then it’s several pages of fighting. 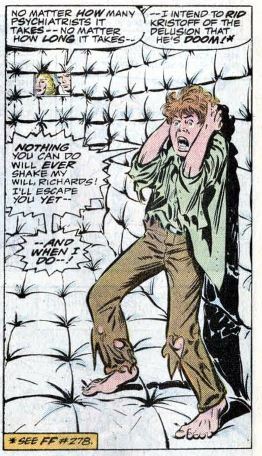 Quicksilver’s speed, combined with his insanity, make him too unpredictable for the FF’s usual tactics. Ben tricks Quicksilver into showing off how he can run on air, by running so fast he creates a cushion of kinetic energy beneath his feet. The problem is, he can’t outmaneuver Johnny when in the air, so Johnny knocks him out. Johnny rescues Alicia, and everyone praises Ben for his quick thinking in the heat of battle. Johnny adds that it felt just like old times. 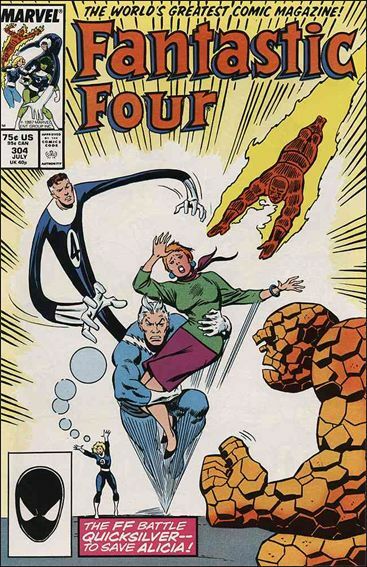 Then the issue ends with Ben announcing that he’ll take the job and become the new leader of the Fantastic Four. Unstable molecule: Reed stretches his body to a rope-like thinness in an attempt to trip Quicksilver, only for Quicksilver to tie him in knots. Fade out: Sue can’t do anything during the fight, but does keep the unconscious Quicksilver in a force field once the battle is over. 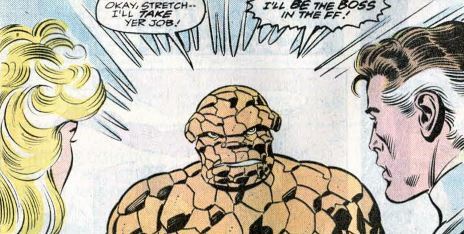 Clobberin’ time: Despite his still being mopey about Johnny and Alicia, Ben says he justifies his staying with the FF because he feels it’s better confront your problems and deal with them, rather than run and hide from them. Flame on: Johnny states that his maximum speed is about 150 miles per hour, and he stimates Quicksilver to be more around 170 miles per hour. Four and a half: We’re told through narration that Reed and Sue still have no idea Franklin’s been doing the superhero thing alongside the Power Pack kids. There’s a one-panel flashback to Franklin and the Pack fighting in the Snark War. The Alicia problem: Alicia toughens up when held captive, demanding answers from Quicksilver. Can we interpret this as Lyja, a spy, being trained to withstand harsh interrogation techniques? Trivia time: Crystal’s break up with Quicksilver and her fling with the real estate agent were chronicled in the Vision and Scarlet Witch miniseries. Fantastic or frightful? The “Quicksilver is a villain now” thing provided a lot of drama in the Avengers titles, but not so much here. It’s interesting in that introducing the new team lineup was done gradually, instead of in one big event issue. Nonetheless, this is where the new team begins.